Webster defines an expert as a person “who has a comprehensive and authoritative knowledge of or skill in a particular area” That being said, when it comes to preparedness, is anyone ever really an expert? Let’s be realistic. Every prepper, myself included, was a novice at one time or another. Along our journey, we have consulted books, websites, blogs, and various government publications in our quest to learn abut preparedness in general and the prepper lifestyle in particular. Were any of the indivdual authors of these sources experts? Perhaps they were but if that were the case, why does our search continue? Having chosen the prepper lifestyle, we continually find ourselves in search of that next best thing, whether it is a piece of gear, a new type of freeze dried food, a fabulous new prepping book or a masterful survival skill. No matter what it is, there always seems to be something out there to capture our attention. While I do believe that is it worthwhile to be forward-thinking when it comes to prepping, I feel it is equally beneficial to reflect on past mistakes. Learning from prepper mistakes is an important part of the process and allows us to to move forward with a renewed sense of resolve to do it better “the next time”. In this article I share some common and not so common prepper mistakes. I have made many of these myself, while others, through dumb luck or planning, have been avoided. 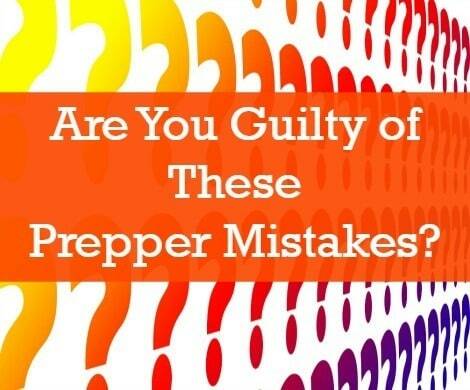 Are you guilty of any of these prepper mistakes? It is easy to amass a sizable supply of food in a short period of time. This is especially true if you tend to purchase a little bit extra each time you shop. Before you know it, you have a closet, pantry, a basement full of stuff but no clue as to what is inside. Creating a master inventory is only half the battle. Adding to the list as new items are purchased and removing items from the list as they are rotated out takes diligence and perseverance. My own efforts in this area are embarrassingly poor. My best advice in this regards is that if you are fairly new to prepping, don’t let this one slip by. Keep track of what you have from the get go and save yourself a lot of grief down the road. Tornado Survival Tips, by Matthew Stein, P.E.